The meniscus, also known as the cartilage of the knee, is a strong fibrous crescent-shaped structure that is sandwiched between the femur, the thigh bone, and the tibia, the shin bone. As you can see in the picture below, there are two sections: the medial meniscus on the inside of the knee, and the lateral meniscus, on the outside of the knee. Their main function is to provide a level of shock absorption in the lower limbs and to prevent friction during movement. 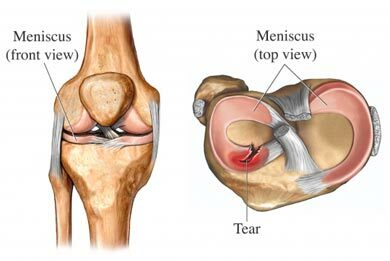 Damage to the meniscus is one of the most common injuries in the knee joint. 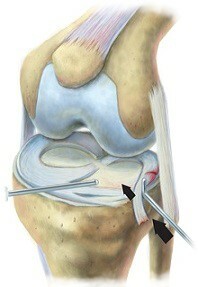 This is often due to a partial tear through either the medial or lateral section, frequently caused by a dynamic twisting movement through the knee leading to a shearing force through the joint. Common symptoms of such a tear include: pain on either the inner or oute r aspect of the knee; swelling, which is often delayed 24-48 hours after the injury first occurred; a locking of the knee whereby it gets truly ‘stuck’ and you are unable to bend or straighten it; and giving way, where the knee collapses underneath you when walking. It is, however, very common to experience only a couple of these symptoms. Here at the clinic, we provide comprehensive treatment for meniscal tears. This includes: advice regarding the PRICE principles (protection, rest, ice, compression and elevation), ultrasound, interferential therapy, acupuncture and Kinesio tape to support it, along with an in-depth rehabilitation programme for you to complete at home between physiotherapy sessions. We generally recommend weekly treatments for meniscal tears, but these are often spaced out as the injury improves. If you have suffered a knee injury, don’t hesitate to call and book an appointment at the clinic on 01279414959.